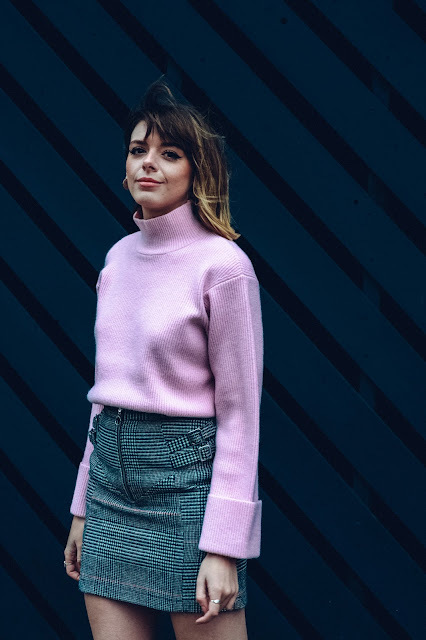 A week or so ago the lovely folk at Klarna set me a challenge to do an online shop using their "Pay later" option, styling together an outfit which best represented both myself and the brand's staple colour scheme... And I jumped at the chance. Why? Well firstly online shopping sounds like THE easiest and most fun challenge ever, am I right or am I right? Secondly as if the premise of shopping for a challenge wasn't enough of a walk in the park, doing it via Klarna's Pay later makes the whole thing even more easy peasy lemon squeezy! Win/win situation! So what exactly is Klarna? In layman's terms it's a new payment option for online shopping which basically makes your whole buying experience a lot smoother, safer and much more simplified so you can shop from the comfort of your bed in the evenings with your cosiest PJs on and quite literally not have a care in the world (my idea of the perfect night in in case you were wondering). How their "Pay later" option works is self explanatory, clue's in the title. If and when you're next shopping with the long list of retailers using Klarna (Retailer Directory is available here) all you need to do is go through to the check out as you normally would, log in to your shop account and choose Klarna Pay later as your payment option and viola! Klarna will foot the bill for your shopping there and then! You then have 30 days in which to pay for the items via Klarna's website and don't worry they send you plenty of helpful email reminders so you won't forget. Prewarning if you're not over eighteen, your first order exceeds £150 pounds, you don't have a good credit history and your billing/shipping address don't match than you won't be eligible for Klarna and therefore you won't see them as an option!... Sorry! And what's the point of it all? Pay later effectively gives you the flexibility of being able to try on what you've ordered before actually paying... Exactly as you would do when shopping in real life! If you don't like what you've ordered simply return it and when you're due to pay Klarna 30 days late, you'll only be coughing up the cash for what you ACTUALLY kept! I don't know about you but I constantly feel like I spend my live waiting for online refunds because I wasn't sure of sizing so I bought multiple or the something didn't look the same in pictures! It's infuriating! Klarna Pay later completely eliminates this unnecessary inconvenience. Right, now down to the good stuff! What I picked for my challenge! 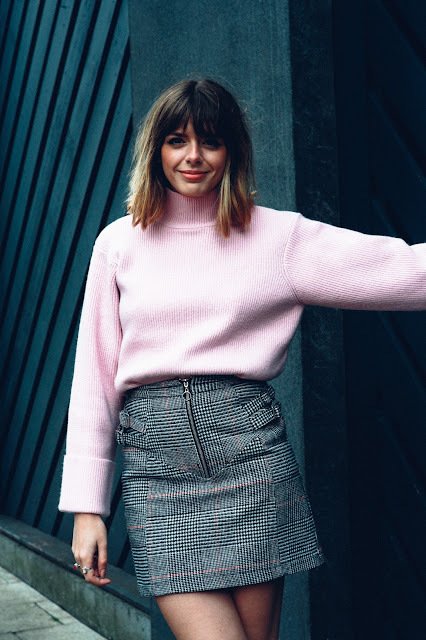 I'm loving the amount of pink and pastel hues sticking around this winter and nothing says Klarna like a good baby pink if you ask me so I started with this incredible chunky knit from Finery London. I absolutely love this online brand! They're designs are simple essentials and you're always guaranteed great quality. I teamed this sugar sweet jumper with another Klarna-esque colour, grey in the form of a tweed style A-line mini from Topshop. The design is a mismatch of tweed, houndstooth and check... All of which are key in this Autumn/Winter's main trends. This overall outfit is kind of a winter staple of mine, super girly yet completely comfy and looks great with either a tailored coat or even a parka! Finish the outfit off with a classic patent ankle boot for a super chic, super timeless sixties inspired look! If you really like the look of my Klarna inspired outfit, why not head over to their Facebook page now where they are running a competition to vote for your favourite look (including mine) for the chance to bag yourself a online shopping spree on them! Your favourite pass time just got even easier.